Yesterday, we got pretty excited because it looked as though ZeptoLab, creators of Cut the Rope and Pudding Monsters, was teasing a new mashup game between Cut the Rope and The Hobbit, or perhaps Lord of the Rings. Unfortunately, that's not what was happening. ZeptoLab promised to unveil the truth, and they did. It turns out that the image of Om Nom dressed like a hobbit on a quest was nothing more than ZeptoLab's way of congratulating The Hobbit on its numerous Oscar nominations. 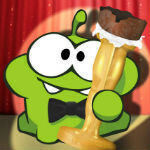 As a reward for his cosplay, Om Nom was given a chocolate Oscar. It's a shame that this game isn't a reality. But, we're wondering if ZeptoLab may have been angling for a partnership with this move. After Star Wars Angry Birds and Temple Run: Brave, movie/game mashups aren't anything new, and maybe ZeptoLab wants in on it.